Temple University School of Podiatric Medicine, 2008. Prior to his fellowship training Dr. D’Angelantonio III completed one of the most comprehensive surgical training programs in the country. He was trained in the most advanced and sophisticated techniques in foot and ankle surgery to-date. This was accomplished through a rigorous 4 year surgical residency within the University of Pennsylvania Health Systems covering all aspects of the foot and ankle, along with the major reconstructive and traumatic surgeries of the lower extremities. Dr. D’Angelantonio III is Board Certified in all aspects of Foot Surgery as well as Reconstructive Rearfoot and Ankle Surgery. He has an in-depth knowledge and comprehensive experience with pre-operative treatment planning, operative experience and post-operative care of patients with congenital and acquired deformities of the foot and ankle. Dr. D’Angelantonio III continues to demonstrate his outstanding ability in treating all foot and ankle disorders as he is recognized annually as one of the Top Surgeons in his field. 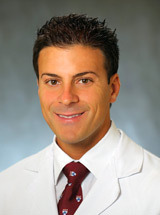 Dr. D'Angelantonio III research goals aim to improve the current operative techniques used in lower extremity reconstruction through the most advanced techniques improving functional and aesthetic outcomes. His background in engineering augments well to the lower extremities as he is an innovator of new techniques that have proven to decrease potential complications improving both functional and aesthetic outcomes keeping patients walking. Messa C, D’Angelantonio A, Fischer J, Rhemtulla I, Broach RB, Chatman B, Mauch JT, Wes A: Institutional experience with ultrasonic debridement for the management of complex lower extremity wounds: A retrospective analysis of clinical outcomes and cost. Annals of Plastic Surgery 2018 (In Press). D'Angelantonio Albert, Levin L. Scott, Mehta Samir, Sarwer David, Lorenzo Matthew, Kovach Stephen: The psychosocial impact of lower extremity amputation. In progress 2018. D'Angelantonio A 3rd, Kovach SJ : Retrospective review evaluating the outcomes of free tissue reconstruction for plantar foot defects. In progress 2018. Multi-Center Trial--In Progress: A prospective, randomized, multi-center trial evaluating the effectiveness of the V.A.C. Ulta Negative Pressure Wound Therapy System with V.A.C. VeraFlo Dressing System in operatively debrided wounds. In Progress 2018. Dr. Albert D'Angelantonio III: Minimally Invasive Repair of Acute Achilles Tendon Rupture. Penn Medicine, Clinical Briefing. Mark Baker (eds.). Penn Medicine, Clinical Briefing, 2018. Multi-Center: Retrospective study examining the clinical outcomes for the use of Integra, negative pressure wound therapy, local flaps and tissue flaps for complex lower extremity wounds. In progress 2018. D'Angelantonio Albert III, Mohler Emil: Stem cell treatment for diabetic foot ulcers. In progress 2018. D'Angelantonio Albert III, Baker Mark: Surgical management of foot and toe deformities. https://www.pennmedicine.org/for-health-care-professionals/for-physicians/physician-education-and-resources/clinical-briefings/2017/1-january/foot-deformity-clinical-briefing Jan. 2017. D'Angelantonio Albert III: Hot topics for the primary care provider. Penn Medicine Cherry Hill. Rachel Donovan (eds.). Nov. 2016. D'Angelantonio, Albert III: Great save: Diabetic patient back on his feet after near amputation. Penn Medicine in the News. Katie Delach (eds.). 2016.